Morea are mainly from South Africa and are fairly easy to grow. A delightful group of flowering bulb who’s flowers resemble those of an iris, Morea aristata and Morea papilionacea are both popular and are originally from South Africa. A number or varieties are available for sale, some with spectacular flowers. Morea aristata (syn glaucopsis) with its attractive blue and white flowers is a standout in the genus. Large white petals with attractive ‘blue eyes’ on each. A deep indigo blue with a turquoise inner and inside that a deep indigo base. The outstanding flowers give it the name of ‘Peacock Moraea’. Flowers are large to 6cm across and these easy care spring flowering bulbs make an excellnet plant either in a container or in the garden. A little varied in flower colour with the salmon pink variety being more common than the yellow form. One variety with yellow petals and salmon pink tepals is available however very rare in cultivation. A sunny well drained position is about all you will need for Morea, they also do well in pots. 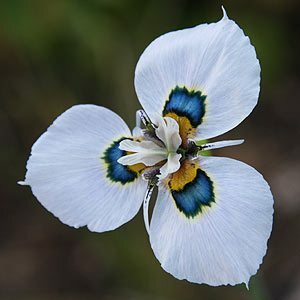 Once planted and watered in Moraea require a dry dormancy from summer to autumn. Divide pot grown plants every 3 years.